Coenties Slip, originally an artificial inlet in the East River for the loading and unloading of ships that was land-filled in 1835, is a historic street in Lower Manhattan, New York City, in the heart of the Financial District. It runs southeast from Pearl Street to South Street, a distance of two blocks (585.6 feet). The entire length of the road is a pedestrian street, though before 2013, the block north of Water Street carried vehicular traffic. In 2003, Gerard Wolfe reported the pronunciation of Coenties to be /ˈkoʊ.əntiːz/ KOH-ən-teez. Earlier reports include /ˈkwɪnsiːz/ KWIN-seez (1896), /ˈkwɛntʃɪz/ KWEN-chiz (1917), and /ˈkwɪntʃiːz/ KWIN-cheez (1908). Although surrounded by skyscrapers, a row of buildings from the 19th century still stands along the block that is open to vehicles, and these buildings are in active use by small businesses. The construction of these high rise buildings resulted in the removal of the blocks between Water Street and Front Street, and between Front Street and South Street. Part of 55 Water Street and part of the New York Vietnam Veterans Memorial are built on land that was once part of Coenties Slip. Both Coenties Slip and Coenties Alley are named after Conraet Ten Eyck and his wife Antje. In 2010, the Downtown Alliance proposed upgrades to Coenties Slip and Whitehall Street plazas. Coenties Slip between Water and Pearl Streets was closed, painted, and converted into a pedestrian plaza in 2013. However, a $23 million permanent upgrade stalled because of a lack of funding. In 2018, New York City Department of Transportation announced permanent upgrades as part of the Water Street upgrade project. Coenties Alley, formerly City Hall Lane, is an historic pedestrian walkway that leads inland from Coenties Slip. The alley runs south from South William Street to Pearl Street, and is the cut-off for Stone Street's discontinuity. In the 17th century, New Amsterdam's City Hall stood at Coenties Alley on the north side of Pearl Street, just to the north of Coenties Slip. For a time in the mid-20th century, Coenties Slip also was the home for a group of ground-breaking American artists. From the late 1950s to the early 1960s, the artists Chryssa, Robert Indiana, Ellsworth Kelly, Agnes Martin, Lenore Tawney, Fred Mitchell and Jack Youngerman lived in this Lower Manhattan location overlooking the East River. 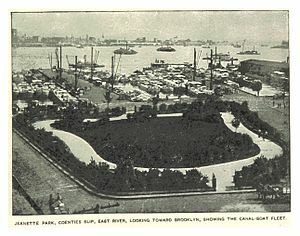 These artists were among a group of intellectuals, writers, filmmakers, and poets who lived and worked in the old seaport at the lower tip of Manhattan called the Coenties Slip. Distinguished by its views of the Brooklyn Bridge and its position between land and sea, the slip served as an important inspiration for the artists, who frequently incorporated aquatic themes into their early work. Selections of their early works were shown in an exhibition, entitled "Between Land and Sea: Artists of the Coenties Slip" at the Menil Collection in Houston, TX, which ran from April 14, 2017 to August 27, 2017. The exhibition featured 27 aesthetically distinct works, united by the artists’ desire to locate new ways of thinking about abstraction. Curated by Michelle White, the exhibition drew heavily from the Menil's holdings and was augmented by important loans from private collections in Houston and the Lenore Tawney Foundation, New York. ^ Wolfe, Gerard R. New York, 15 walking tours: an architectural guide to the metropolis (2003), p. 60. ^ Earle, Alice Morse, "The Stadt Huys of New Amsterdam," Half Moon Series, Vol 1, No 1 (1896), p. 4. ^ Miller, Alice Duer, "The Happiest Time of Their Lives," The Century [Magazine], Vol. 95, No. 1, November 1917, p. 23. ^ Phyfe, William Henry Pinkney, Twelve thousand words often mispronounced (1908), p. 562. ^ "The Alleys of Lower Manhattan". Forgotten NY. Retrieved 2010-05-29. ^ collectableivy (2017-06-20). "New York's Lost (and Found Treasures)". Pied-A-Terre Books Blog. Retrieved 2017-06-20. ^ a b Glassman, Carl (July 19, 2018). "Water Street Redesign Plan Is Finally on the Road to Reality". Tribeca Trib Online. Retrieved April 8, 2019. ^ Plagianos, Irene (March 8, 2013). "New Pedestrian Plazas Coming to Water Street". DNAinfo New York. Retrieved April 8, 2019. ^ a b "Quality of Life Improvements". Lower Manhattan Construction Command Center. Archived from the original on 2010-04-28. Retrieved 2010-05-29. This page was last edited on 8 April 2019, at 19:49 (UTC).